If you're planning a getaway to Moore and you don't really know a great deal about it, there's no need to worry — we'll fill you in! This neighborhood is located 9 miles (14 kilometers) south of central Oklahoma City, the state capital of Oklahoma. 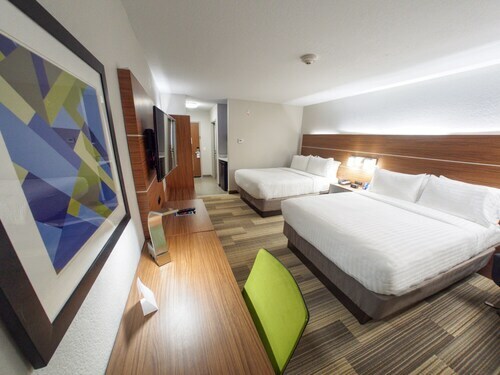 Travelers to Oklahoma City will be sharing space with approximately 600,000 people. If you're planning a vacation in Moore, you'll want to listen up! You can save tons by securing a Travelocity accommodation and airfare deal. Simply select from more than 400 partner airlines and 665,000 places to stay. Way too many choices? We'll make it easy for you! From airfares and accommodations to car rentals and activities, we can give you the peace of mind of 24/7 personal assistance with our Customer 1st Guarantee. Encountered a better deal? We'll match the price and refund the difference^. With no hidden fees or charges from us, you won't need to stress about having to change your travel plans. And as long as you get in quick, most accommodations won't charge you a fee either^. Roam Moore by day and then spend your nights in one of the 22 properties just a quick commute away. Unfortunately, this neighborhood doesn't offer the easiest access to accommodations, so get in fast to get your room of choice. Look into the offers at the Residence Inn by Marriott Oklahoma City South (1111 E I 240 Service Rd) and the Embassy Suites Norman - Hotel & Conference Center (2501 Conference Center Drive). Where do you fly into for Moore? Grab your bags and your passport and prepare for a spectacular adventure. The moment you touch down at Will Rogers World Airport (OKC), you'll be just 8 miles (13 kilometers) northwest of Moore. Can I rent a car in Moore? Tickets to Moore? Check. The ultimate road trip playlist? Check. All that's left to do is choose a ride via Travelocity. You'll be cruising down the road in no time! Picking up the car keys right at Will Rogers World Airport means you'll be out of the cabin and onto the highway in no time. Alamo Rent A Car is one good option here. Enterprise is also worth looking into. To be found 1 mile (2 kilometers) from the city center at 406 N Telephone Rd is Enterprise. Head there and they'll get you cruising around town in no time! Veterans Memorial Park is a green oasis amid the hustle and bustle of life. Kick off your shoes and feel the cool grass under your feet or simply lie on your back and search for shapes in the clouds. Need some more ideas? With its flashing lights and buzzing machines, AMF Moore Lanes is an exciting, stimulating place to visit. Try your luck at pinball or simply enjoy watching the young ones as they try and settle on which game to play first! Head to Smith Village. It is around 8 miles (13 kilometers) away. 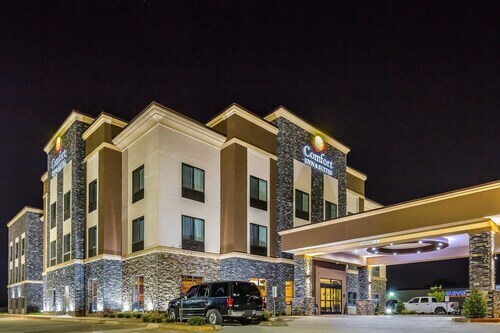 Situated in Moore, this hotel is 0.2 mi (0.3 km) from First Christian Church and within 3 mi (5 km) of Yellow Rose Theater and Moore Golf and Athletic Club. Earlywine Park and Museum of Osteology are also within 6 mi (10 km). Located in the heart of Moore, this motel is 0.5 mi (0.9 km) from First Christian Church and within 3 mi (5 km) of Yellow Rose Theater and Moore Golf and Athletic Club. Crossroads Shopping Center and Museum of Osteology are also within 6 mi (10 km). Situated in Moore, this hotel is 0.4 mi (0.7 km) from First Christian Church and 2 mi (3.2 km) from Yellow Rose Theater. Crossroads Shopping Center and Museum of Osteology are also within 6 mi (10 km). Situated in the business district, this hotel is 3 mi (4.9 km) from Veterans Memorial Park and 3.1 mi (5 km) from Moore Golf and Athletic Club. Lightning Creek Park and Museum of Osteology are also within 6 mi (10 km). 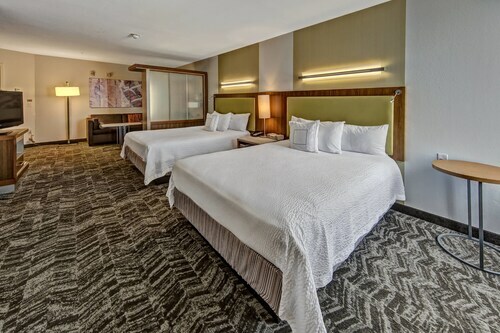 Situated in Moore, this hotel is 0.9 mi (1.4 km) from Moore Golf and Athletic Club and within 3 mi (5 km) of Yellow Rose Theater and Andy Alligators Fun Park. First Christian Church and Veterans Memorial Park are also within 3 mi (5 km). Situated in the entertainment district, this hotel is close to First Christian Church, Yellow Rose Theater, and Moore Golf and Athletic Club. Area attractions also include Museum of Osteology and Crossroads Shopping Center. Situated in the suburbs, this hotel is 0.4 mi (0.6 km) from First Christian Church and 1.9 mi (3.1 km) from Yellow Rose Theater. Crossroads Shopping Center and Moore Golf and Athletic Club are also within 6 mi (10 km).